Founded by a dynamic young Kurdish woman, the Hakkari Power women's football team from south-eastern Turkey has an enviable score record and a growing number of players. Currently at the top of the second division, the team has broken down taboos in a traditionally conservative region. Women’s soccer in Turkey is a marginal sport with a recent history. The national team ranks 64th in the FIFA ranking behind Iran, Myanmar and Haiti and 34th in the UEFA list. There is one first division and then eight second divisions divided regionally. And while the sport is dominated by the wealthier and culturally more westernized coastal part of the country, there is a succesful women’s team in the southeastern corner, in Hakkari, a region bordering on both Iraq and Iran. 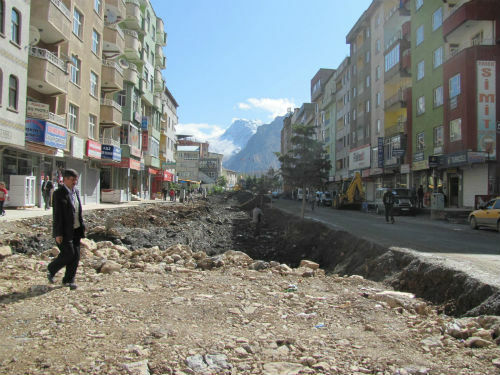 Hakkari (Kurdish: Colemerg) is among the least visited places in Turkey. The province does not have an airport – the nearest is in the city of Van, more than a three-hour drive north. To the east and south are Iran and Iraq and to the west it is a four-hour drive to the city of Sirnak, which doesn’t have an airport either. For a provincial capital, the city is tiny with no more than 50,000 inhabitants, of which the vast majority are Kurdish Sunni Muslims. The Turks in the capital tend to be bureaucrats working for the governorship, as well as soldiers, members of the gendarmerie, policemen or teachers, both at schools and at the newly-founded university. The city and province is a stronghold of the Kurdish BDP (Peace and Democracy Party) and one of the areas which sees a good number of clashes between the PKK and the Turkish Armed Forces. On top of that, Hakkari is more than 1,700 metres above sea level and is surrounded by mountains. In winter the road to Van is often closed due to snow and anyway at that time of year it gets dark at 4pm. In 1982 a movie was made called “A Season in Hakkari”, describing the fate of a teacher who was forced to work there for one school year. Depressing. The local stadium (a euphemism for a synthetic turf field with one grandstand for maybe a thousand people) does not have floodlights. The only lights available after 4pm in December are some street lamps from across the street. Around 10 women, or rather girls, do some light warm-up training on a Wednesday at around 6pm. Well, it wouldn’t matter which day, because: “We train 6 days a week and one day is either for rest or else for a league match”, says coach Tahir Temel. Next to him stands the founder, manager and captain of the team, Cemile Timur. She is also the oldest player of the team at 22 , the rest are between 12 and 19 years young. Cemile was 18 when she founded the team in April 2008. “I have been active in sports since 1999, basketball, athletics, then I became a soccer referee for men’s matches. I thought that a women’s team was definitely missing in Hakkari.” Cemile is currently studying sports management via distance learning, which will be her second degree after computer sciences. The first team in 2008 had 8 players, and they lost their first match 0-7 in Antakya. But since then, the team has been writing a success story for themselves, both in terms of results on the pitch and the size of its membership. “First we thought it could be problematic for the girls to play in shorts. It is a very conservative region.” But these worries were unfounded. The club now has 47 registered female players, 25 of whom are in the extended squad. And from the first season onwards, the name of the club became its programme: Hakkari Gücü, which means Hakkari Power. The team, currently in one of the eight second divisions, has reached the play-offs every year, when the two best teams of all eight divisions play for a place in the first division. Last season Hakkari Gücü was the only team in Turkey’s first and second leagues, men and women, which did not concede any goals. But they scored 72 . They made it to the final of the play offs and only lost against Eskisehirspor. In the current season, the team has won all four matches so far and has a goal balance of 19 – 0. But besides these positive results, being in the team has also meant that some of the girls can study at prestigious sports high schools: currently five players are studying in Van. They train there and just join the team for the league matches. “Three of our former players are in the national team and two of our players made it to the first division and play for Mersin and Trabzon,” adds coach Temel. The goal for this season is to win the play-offs and play in the first division next season. If Hakkari manages this, then sponsorship will also become necessary to pay travel expenses for the matches in western Turkey and to make the team’s training more professional. But by then, Cemile will already be 23 and will certainly be able to organise that, given her impressive track record.